you’ll also receive a $200 rebate certificate*! How Does the Rebate Promotion Work? Not a Member of Brilliant Distinctions®? Sign up to receive up to 1,600 points for your CoolSculpting® treatment! Want to learn more? Read the CoolSculpting patient FAQs and watch real transformations now. *Instant rebate is only valid for members of the Brilliant Distinctions® Program, and can only be redeemed at participating provider offices. Can only be redeemed when six (6) or more CoolSculpting® treatments were performed during the office visit. Valid only if six weeks have passed since the last CoolSculpting® treatment. Members will earn Brilliant Distinctions® Points on their treatment. 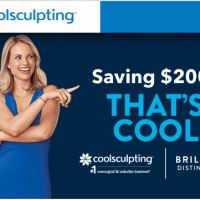 Instant rebate can be combined with Brilliant Distinctions® Rewards, but cannot be combined with any other CoolSculpting® rebates. One (1) rebate per member. Rebate is only valid from April 1, 2018, to September 30, 2018, and cannot be redeemed by members who have had three (3) or more CoolSculpting® treatments in the past 12 months. Can only be redeemed for 6 or more CoolSculpting® treatments (cycles). The CoolSculpting® procedure is FDA-cleared for the treatment of visible fat bulges in the submental area, thigh, abdomen and flank, along with bra fat, back fat, underneath the buttocks (also known as banana roll), and upper arm. It is also FDA-cleared to affect the appearance of lax tissue with submental area treatments. During the procedure you may experience sensations of pulling, tugging, mild pinching, intense cold, tingling, stinging, aching, and cramping at the treatment site. These sensations subside as the area becomes numb. Following the procedure, typical side effects include temporary redness, swelling, blanching, bruising, firmness, tingling, stinging, tenderness, cramping, aching, itching, or skin sensitivity, and sensation of fullness in the back of the throat after a submental area treatment. Rare side effects may also occur. The CoolSculpting® procedure is not for everyone. You should not have the CoolSculpting® procedure if you suffer from cryoglobulinemia, cold agglutinin disease, or paroxysmal cold hemoglobinuria. The CoolSculpting® procedure is not a treatment for obesity. Ask your doctor if CoolSculpting® is right for you. To learn more about what to expect, visit coolsculpting.com.